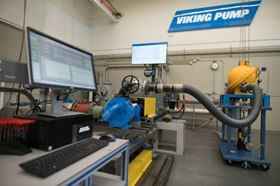 Viking Pump's expanded lab in Cedar Falls. Viking's remodel project added a total of 3800 sq ft and the original 1600 sq ft was renovated to house a 300 HP Dynamometer, two 50 HP Dynamometers, a Distek Data collection of software for five Dynamometers, two 5600-gallon tanks of testing oil, and two 5-ton overhead cranes. As well as standard certified performance testing of each pump, the new research lab can undertake additional testing, depending on the application and product. “Finite Element Analysis (FEA) is used to optimize component strength, Computational Fluid Dynamics (CFD) is used to optimize fluid flow through the pump, and statistical tolerance stacking software is used to make sure designs are repeatable and to deliver consistent performance from pump to pump,” explained Derrick Goddard, Viking’s interim president. “We also developed a scalable new product development process called ‘Concept to Customer.’ This staged program outlines research, testing, Voice of Customer, and operational and market requirements for the implementation of new products. The program has increased our efficiency, as well as guided product development and project funnels for continued research and development,” said John Stillman, Viking Distribution Business Line Leader. The lab complements the other Viking-owned facilities located in Cedar Falls, including a machining/assembly plant, alloy and iron foundries and the original historic headquarters building. Founded in 1911, Viking is owned by Idex Corp.